If you want to remove or Blogspot from your blog address, then you have must add a custom Domain in Blogger manually. 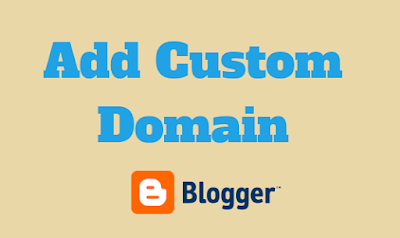 You can easily add custom Top Level Domain (TLD) on your Blogger blog. But before learning how to add the custom domain blogger, you should know the advantages of adding custom domain and the advantages of putting the default (Blogspot sub-domain). Branding and promoting: Custom domain is easy to remember and since it can be customized, the simple but unique name will help to make your blog a brand among your audiences. And branding is the required to promote your blog to generate revenues. Non-Hosted AdSense Account: Having a Top Level Domain is one of the required conditions to get a non-hosted AdSense account. Probably, you may know the difference between hosted and non-hosted AdSense account. Different type of accounts has different advantages. Others Ads Network: Not only for Google Non-Hosted AdSense but also others popular Ads Network like Media.net, Buy Sell Ads, Propeller Ads, AdSterra also require a custom Domain to approve. Affiliate Marketing: If you want to connect your blog with Affiliate programs like Amazon, CJ, eBay etc. you need a custom Domain. Free: Yes. blogspot sub-domain is free for lifetime. You don't need to renew it like for custom domain every year. So you haven't any tension to lost your domain for not bearing the cost. Free SSL: You can get free SSL (Site Security Lock) for your blog from here and it is enabled by Blogger. But if you want to get this feature for the custom domain you need to pay for this domain provider and it is little difficult to enable. Fast AdSense approving: It is very easy to get AdSense approval from Blogspot sub-domain. The approval process is faster than custom domain. 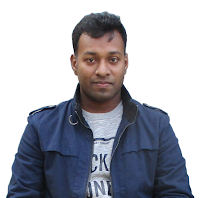 This account type is hosted. You can put Ad code only on this blog. But the income is same as non-hosted. 1. Purchase Domain: Buy a TLD domain from Domain provider who provides the full control panel that allows adding, delete, modify CNAME, A, TXT, NS Records. I suggest you buy Domain from Godaddy, Namecheap. You can also purchase from others. 2. Set up Domain from Blogger Dashboard: Go to Blogger Dashboard → Settings → Basic → Publishing → Set up a 3rd Party URL for your blog and put your Domain name with www in blog address. Next click on Save button.Your saving won't be saved and you will see an error like "we have not been able to verify your authority to this domain. error 12/14." But don't worry. Just follow the next steps. After trying step 2 you will see an option like below, where it shows some generated code. Copy the both for further use. Look, here in two rows and two columns: first row refers www for ghs.google.com and second refers some generated key for some generated destination. The first column represents Name, Label or Host Field and the second column represents Destination, Target or Points to Field. Whatever, backup all and don't share with others. 3. 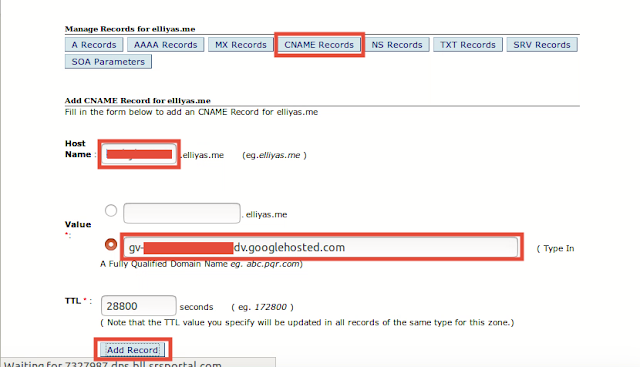 Add CNAME on Domain Control Panel: Go to your Domain Control Panel and find an option of CNAME → Click on 'Add a CNAME' option → Insert www on Host Field/Name/Label and insert the ghs.google.com on Destination/Target/Points to Field → Save. Similarly insert generated key for second row. Insert key from first column in Host Field/Name/Label and key from second column in Destination/Target/Points to Field. Next Save. 4. 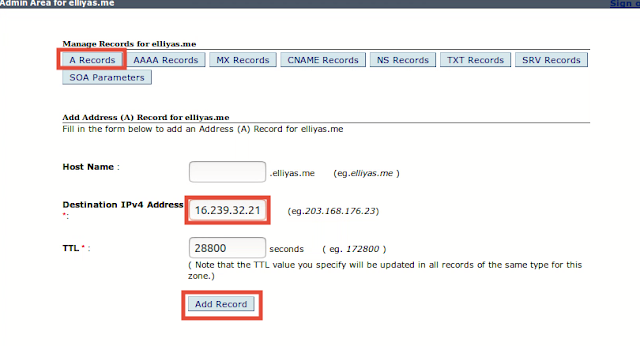 Add A Records on Domain Control Panel: Similarly, Step 3 you will find an option to add A Records. Insert the following IP addresses once-by-once. You have done. 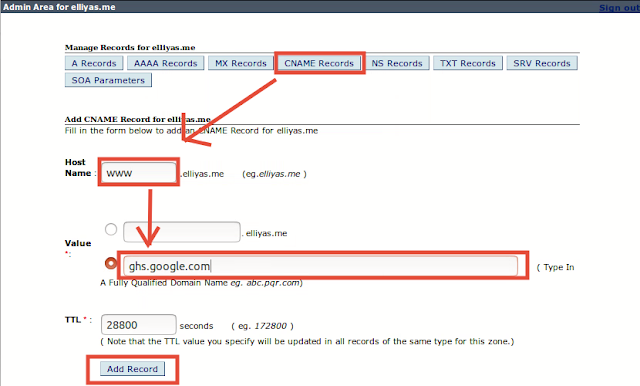 Now check the domain verification from Google Webmaster Tool from same Gmail account by which you create a blog on Blogger. It will take several hours to verify. 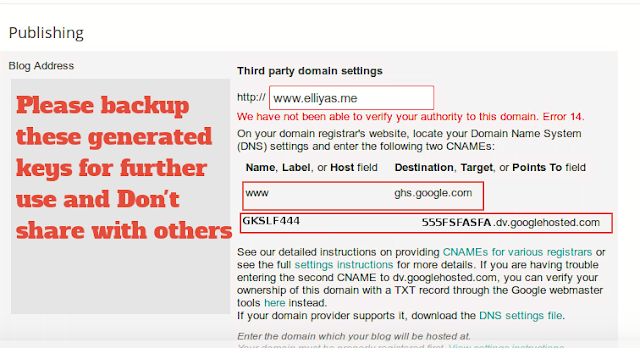 If you face any trouble to Set up the custom domain for Blogger through this process or others let me know by comment.